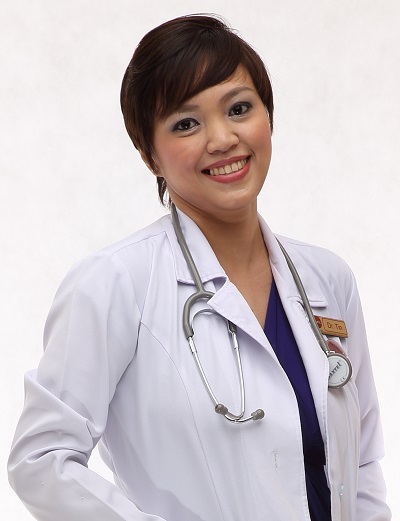 Dr. Kristine Marie Gozum is a graduate of St. Luke's Medical Center - William H. Quasha Memorial in Quezon City, Philippines. She took her medical internship training at St. Luke's Medical Center, one of the Philippines' most renowned medical institutions. As part of her medical education, she has likewise attended training at the National Center for Mental Health (Neurosciences), Philippine National Police Crime Laboratory (Pathology), San Lazaro Hospital (Internal Medicine) and East Avenue Medical Center (OB-Gyn). She passed the Physician Licensure Examination in February 2007 and is currently a general practitioner and registered Medical Technologist in the Philippines. Being a general practitioner, Dr. Gozum is knowledgeable about broad range of illnesses and treats patients of all ages. She collaborates with other medical specialists should the need arise for a patient to be a referred for specific medical attention, and attends various seminars throughout the year to keep up with the latest developments in primary care. Dr. Gozum has been working with us since May, 2016.